The Catering Factory's team of event planning experts will create an experience that meets your every need. Let us make your event worry free and memorable! We have created many exciting menus for a variety of occasions. The Catering Factory corporate catering division is in the business of making you look good. Simcha menus for your happy occasion. I have used the Catering Factory for personal and business related entertaining. Chef Faustino and his team are fabulous! They will customize the menu to meet your specific needs. Chef Faustino will work with you to design food and wine pairings. His Paella is a showstopper, you would think you were dining in Spain! We all think of The Catering Factory as our in-house resident caterers. Whether we need a lunch for 10 or a dinner for 200 The Catering Factory handles it all with great ease. Their food is always sensational, beautifully displayed and absolutely delicious. They are the best. Fabulous, Fabulous, Fabulous! I cannot thank you enough for making my granddaughter's Bat Mitzvah luncheon so special. The food was absolutely delicious, the buffet presentation was spectacular, and the room looked beautiful. You exceeded our expectations on everything. The guests could not stop raving about how wonderful it all was. You and your staff were so well prepared and so mindful of all the little details that went into making our memorable event a success. It was so nice to have everything run so smoothly. What a pleasure it was working with you! I would have no hesitation in recommending you to any other prospective clients and our family will definitely use you again. Thank you, thank you, thank you. This was just a yummy and wonderful party. Austin and Gabi were terrific and the food was incredible. Everyone enjoyed including ME. 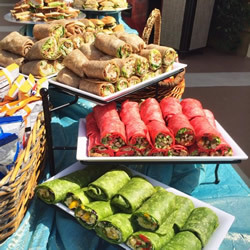 The Catering Factory provides the very best in catering and event planning services for private and corporate clients in Orange County California area. Each and every employee at The Catering Factory is dedicated to excellence in the products served and the services provided. O ur Culinary experts will create and prepare the menu you desire. 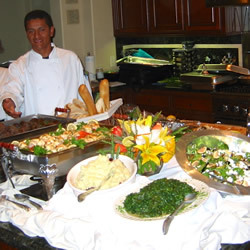 The professional team of food servers, banquet captains and scullery staff will ensure an effortless event. We emphasize exceptional service and dazzling presentation. Introducing the Wellness Program. Daily home delivery. Do you want to eat well every day? Have our gourmet diet delivery program delivered to you! 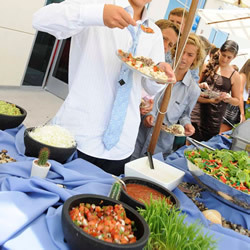 The Catering Factory provides the very best in catering and event planning services in Orange County California. Our Culinary experts will create and prepare the menu you desire. We emphasize exceptional service and dazzling presentation. "Thank you, thank you, thank you. This was just a yummy and wonderful party. Austin and Gabi were terrific and the food was incredible. Everyone enjoyed including ME." "I have used the Catering Factory for personal and business related entertaining. Chef Faustino and his team are fabulous! They will customize the menu to meet your specific needs. Chef Faustino will work with you to design food and wine pairings. His Paella is a showstopper, you would think you were dining in Spain!" "We all think of The Catering Factory as our in-house resident caterers. Whether we need a lunch for 10 or a dinner for 200 The Catering Factory handles it all with great ease. Their food is always sensational, beautifully displayed and absolutely delicious. They are the best." "Fabulous, Fabulous, Fabulous! I cannot thank you enough for making my granddaughter's Bat Mitzvah luncheon so special. The food was absolutely delicious, the buffet presentation was spectacular, and the room looked beautiful. You exceeded our expectations on everything. "